"After much trial and error, the best way I've found to make Green Chile Stew! Easy to put together and delicious to eat. 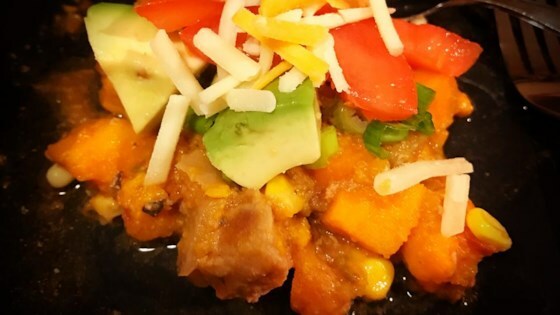 I think the yams and corn give it a little something extra, plus it's a great way to get more veggies in. All in all a very hearty meal. I like to serve with quartered tortillas for dipping!" Combine the pork, tomatoes, green chiles, yams, onion, garlic, cumin, oregano, salt, black pepper, and hot pepper sauce in a slow cooker. Cover, and cook on Low until the pork is very tender, 6 to 7 hours. Stir in the frozen corn, recover, and cook until the corn is hot, 10 to 15 minutes. Sprinkle with shredded Cheddar cheese to serve. It was just average. The concept looked great, loved the idea of Yams and corn. My husband doesn't want to eat it for leftovers. I wish it were good but I have to give it a thumbs down. Great recipe. I added 1 can of chicken broth. Great recipe, Bonney Lake, Wa. Didn't have a pork roast handy so I used 10 oz of chorizo and added diced potatoes. Used butternut squash instead of yams. What a great recipe.